Nothing is more important than helping people live full and dignified lives within the comfort of their own home. Sometimes that means providing home health care (Personal Care). 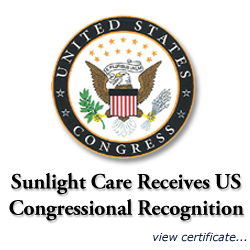 At Sunlight Care we provide affordable home health care to residents that wish to remain at home. Our goal is to provide home health care for your loved ones so you and your loved ones can lead productive and dignified lives. Frequently family members happily provide supportive services for their loved ones but they are not comfortable providing some of the more personal care that your loved one may need. Sunlight Care home health aides can supplement the care that family members provide with personal care services like bathing, toileting or dressing. This extra help also allows the primary caregivers to get to work on time, see the kids' shows, have vacations, and get more sleep. 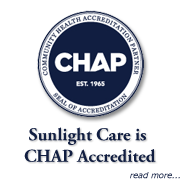 With Sunlight Care home health care, you are not alone. Our flexible services and customized home health care plans will improve your family's quality of life while maintaining dignity for everyone. Our Home Health Aides are trained and licensed through the Board of Nursing and are qualified to provide not only companion/homemaker services but also personal care to your loved ones. 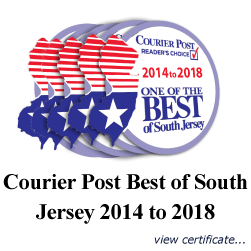 Contact us today to schedule your free assessment at (856) 780-4000!